FRAMINGHAM, Mass., September 14, 2017 – International Data Corporation (IDC) expects the popularity of wrist-worn devices – including watches and wrist bands – will continue to drive the wearables market forward. Meanwhile, lesser-known wearable products, such as clothing and earwear, will experience market-beating growth in the years to come. 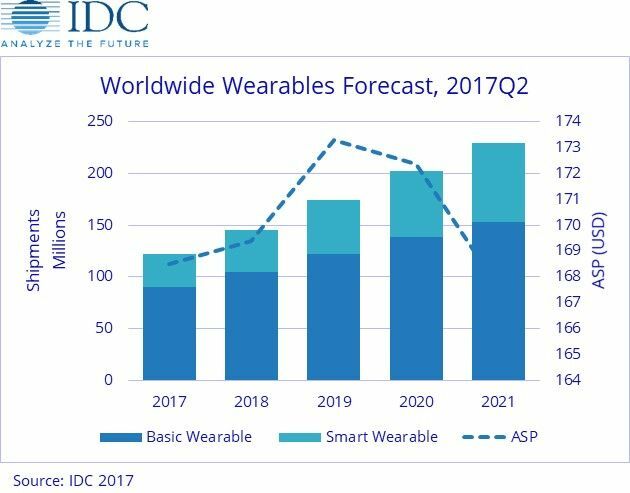 According to a new IDCWorldwide Quarterly Wearable Device Tracker forecast, vendors will ship a total of 121.7 million wearable devices this year, marking a 16.6% increase from the 104.4 million units shipped in 2016. The wearables market is forecast to maintain this pace of growth with shipments reaching 229.5 million units in 2021, resulting in a five-year compound annual growth rate (CAGR) of 17.2%. "We expect the most innovation and development in the wearables market to take place on the wrist," said Ramon T. Llamas, research manager for IDC's Wearables team. "It's the ideal location for users to collect, view, and interact with data and applications, and the point to execute tasks like responding to notifications or communicating with other people and devices. Layer on top of that varieties in style, design, segment, and feature set, and wristworn wearables are poised to remain well out in front of the market." Outside of wrist-worn wearables, IDC also anticipates clothing and earwear – though small in volume and market share – will develop quickly as feature sets emerge. Earworn wearables with personal assistants built in or clothing that tracks your vital signs and transmits them to your doctor can be very powerful solutions for select users, and clearly there will be plenty of possible use cases. "Other factors fueling growth in the wearables market will be the inclusion of cellular connectivity along with improved sensors and algorithms," said Jitesh Ubrani senior research analyst for IDC Mobile Device Trackers. "Not only do these technologies provide increased accuracy, but they also make it possible for companies to sell wearables through new channels and more importantly, to new customers." Watches , encompassing both smartwatches (capable of running third-party applications) and basic watches (which do not run third party applications), will comprise the majority of wearable devices throughout the forecast. Apple and Android Wear will drive the market forward, but the market will also see new entrants running on their own proprietary operating systems (i.e., Fitbit's own Java-based operating system and Garmin's Connect IQ). Meanwhile, basic watches will see their volumes swell past smartwatch volumes by adding wearable technology to traditional watches. Altogether, the diversity of watches and experiences will appeal to a similarly diverse audience with differing tastes and preferences, leading to a larger total available market and growing volumes each year. With just a 1.9% CAGR across the forecast horizon, wrist bands will see slowing growth as the market consolidates towards market leaders, leaving smaller vendors to evaluate their strategies. Also adding to the competitive pressure are declining average selling prices (ASPs) and experiences that show little differentiation against each other and the market leaders. Still, with a relatively simple and straightforward value proposition that most users understand and welcome, wrist bands will continue to find a place in the market. Clothing will trail far behind wrist-worn wearables, capturing single digit market share but outperforming the overall market in terms of growth. Fitness-oriented clothing for professional and semi-professional teams and athletes, with features that track fitness performance and fatigue embedded within the clothing, will drive volumes forward. Consumer interest will trail further behind as most of these features replicate experiences found on other wearable devices. Earwear (excluding Bluetooth headsets) will likewise maintain single-digit market share, but will enjoy the fastest growth of any product within the market. Earwear presents a different value proposition compared to other devices in that users consume the data over audio. While conventional music playback seems to be the common thread across all earwear, users can also look forward to fitness tracking and coaching, real-time language translation, and audio modulation. Jewelry, clip-on devices, non-AR/VR eyewear and any devices that do not fit neatly into our listed products fall into the Others category. These tend to target specific users and have only a handful of vendors offering them. As such, total market share is expected to remain less than two percent at any time during the forecast. Still, the technologies brought forth from these innovations merit close and continued observation, in that they can reveal unique insights and perhaps be appropriated into other products.